Mandy and Kevin have been married for five years. It was not their anniversary, or any other special occasion, but the idea of having some photos taken of themselves having a great time seemed like a good idea. The three of us managed to find an evening this past summer (where it was not raining) to spend some time in downtown Saskatoon and take some fun shots. It may not have been raining that night, but it had most definitely rained the day before. I remember that evening being particularly more humid than Saskatoon usually gets which created a very hazy sky. And with that rain came an army of mosquitoes that swarmed us when we made our way to the river bank. Between all of the swatting of mosquitoes, and scratching of new bites, I was able to get some awesome shots of Mandy and Kevin. The two of them were absolute troopers amongst the crazy mosquitoes. We probably could have shot a little longer, but in the end the mosquitoes won the battle. Here are some of my favourite photos from the shoot. Be sure to also check out the high definition slideshow to see even more images of this great husband and wife. Mandy and Kevin from Hemant J. Naidu on Vimeo. December 4th was Help Portrait day around the world, and Saskatoon was not going to miss the opportunity to participate. Help Portrait is, “a global movement of photographers using their time, gear and expertise to give back to those in need.” A group of seven photographers and ten volunteers spent that last few weeks planning Help Portrait Saskatoon. Check out this short videos to get a better idea of what this awesome movement is all about. We set up our two studios in the downtown Salvation Army and planned to shoot between 10:30am and 4pm. Since this was the first year for Help Portrait Saskatoon we had no idea how many people we’d get that wanted their portraits taken. The morning started off with a nice steady flow of people, and as the day progressed our waiting area became jam packed with people excited to have their individual, couple, and family portraits taken. 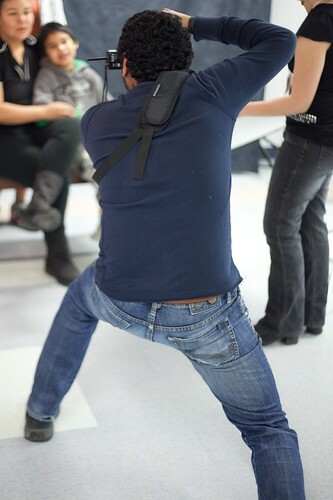 And as a bonus, none of them laughed at my ridiculous shooting stance. The Help Portrait team was not so forgiving. The experience was incredible and it wouldn’t have been possible without a great team of volunteers. Very few of us knew each other outside of Twitter and Facebook, but being strangers didn’t stop us from pushing to make this great cause a success. By the end of the day we had taken photographs of 105 fantastic people, most of whom were in family portraits. And as an early holiday gift, each person will be able to pick up their prints at the Salvation Army next weekend. This is only the second year since Help Portrait started, but judging by the incredible participation of cities around the world and the extensive media coverage, it’s only going to get bigger each year. 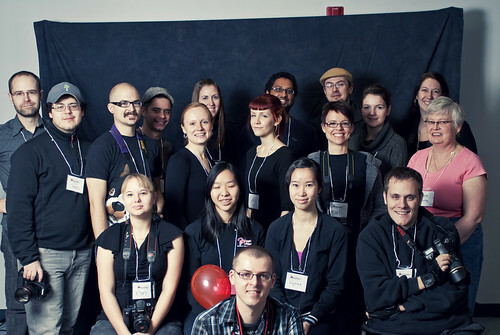 We’ve already started talking about Help Portrait Saskatoon 2011, and we’d love to see more photographers, make-up artists, and volunteers join us next year. Help us get the word out. This is an fabulous cause and we need all the help we can get. And if you’re interested in more information about the origins of Help Portrait, here’s a short video by the founder Jeremy Cowart.